As we all know BM camera use internal battery, that, I think is bad design solution. So, for any real shooting you need external battery connected to power input. Most of this solutions will be using 12V output. I'll be adding to this topic all suitable solutions that I know. Some of our deal partners manufacture suitable solutions and I also hope to have them soon on deals in special kits aimed to future BM camera users. This is Tilta power solution. Not very cheap, but made to last and has much better connectors compared to competition. I'll keep adding various stuff in upcoming time. I think that indeed, it is very good that there is an internal battery + DC connector. Everyone who would seriously need such camera would need external powering solution... so the internal battery is a great backup. Remember, this is not run&gun camera, where the size matters. In this case why not to make it true backup battery? I think that this whole battery decision solution is not good. As this battery can start chargin in unpredictable time and, remember, it will be hot durind charging. So, expect strange noise fluctuations. Well.. I'd say lets wait and see. In my personal opinion, I would prefer this same solution with GH2 as well - to have battery + DC plug... and not the stupid DC coupler. Does Tilta also make a Anton Bauer 3 stud plate? Thanks! I was talking about different situation. Many owners (and most serious ones) will have external power constantly connected. If you look at notes behaviour, they start small recharging unpredictably (if you have DC plugged over long time). Same thing will happen if your camera just had uncharged battery - you'll get much worse internal temperature, as it'll be charging during shot. We also do not know many parameters, like maximum percentage usage of the battery (must be high, as they optimized external design). Such batteries degrade very fast, and if you combine it with very pretty battery position, it could be even worse. I believe that if you have the dc power connected and the battery is full it will run only from external power, and battery is deactivated am i right? Concerning Vitaliy's good point about the internal battery's charging cycle heat and its possible affect on video quality: Hopefully the cam's cooling system can handle the situation, but we probably won't know for sure until after the camera ships. What specs are we looking for when searching for cinema camera batteries? I guess anywhere in the 12v to 30v range is okay but any other important features that would make a battery incompatible? For example, are these possible options? 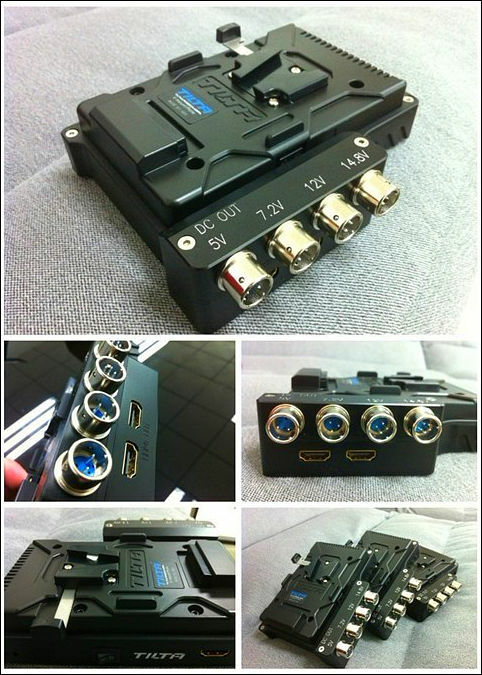 Here's one of the first power accessories for the Black Magic camera.